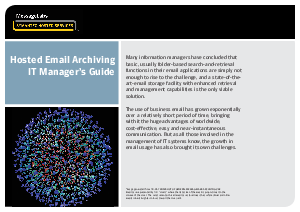 Thinking about email archiving? There are many issues to consider; installation & set-up, data storage & security, search & retrieval capabilities; it can be a complex part of your email system, yet one that is a priority as use of email in the workplace continues to grow. With a cloud based archiving service much of this complexity disappears. Installation is quick & easy, storage is unlimited and search results are returned in seconds. Email archiving can be easier than you think.